Just got home from the first tri of the season! Huzzah! What a delightful time! I raced the Subaru Triathlon Series in 2009 and adored it, I’m so happy to be at home for the summer, and to have a chance to race this season again! It was also the first tri I ever did, so it has sentimental value for me! It was at Shawnigan Lake! It’s a beautiful lake and it was an amazing day, weather wise. The water was chilly, but not too cold, I was pretty happy to have my wetsuit tho. The bike is VERY hilly, so the ride is challenging, but also amazing. The scenery is just stunning!! I ended up with an overall time of 1:37:28 in the sprint distance, which isn’t too bad for the first race of the season. I love racing because it really shows you what you need to work on. I always feel re-focused after a race. I need to do more swimming in open water, that’s for sure! There’s a big difference between pool swimming and lake/ocean swimming and sometimes I forget that. So, moving forward, lots of open water swimming. My knee didn’t think running was fun, but it never really does. I have lots of thoughts to share but I’m currently in a bit of an endorphin haze and need to stretch. More later. Well hello!! If you’re here it means you’ve made it over to the new site from the old blog! Welcome! I hope you like it here as much as I do! Race season is fast approaching! My first little race will be the Times Colonist 10k for which I’m part of a fun little race team of co-workers and friends from downtown. After that it’s non stop through the summer. 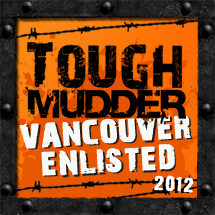 One race I’m getting really excited about is Tough Mudder!! In case you don’t know, TM is a 12 mile run with 25 obstacles designed by the British Special Forces. It’s pretty much the toughest event on the planet. I can’t wait!! There’s so many crazy obstacles, hay bales on fire, electrically charged hanging strips, mud pits with barbed wire above them….the list goes on! June 24th!! It’s happening in Whistler and I’ll be a part of it! !